Escape for Men starts of with a crisp clean sparkle and dries down to notes of Vetiver and Sandalwood. The Birch leaves in the top note gives the fragrance it's green fresh essence. There are 82 reviews of Escape for Men. 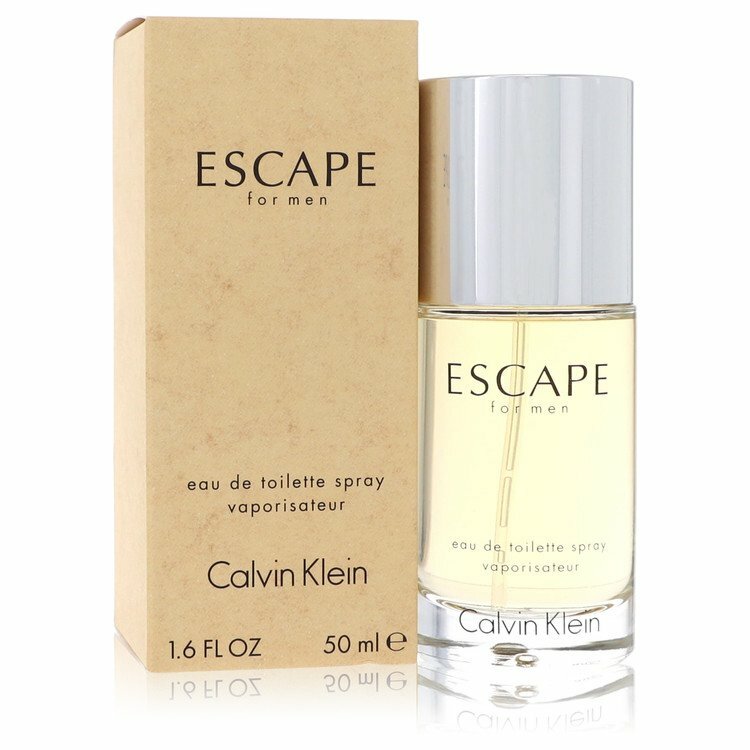 Calvin Klein Escape for Men (1993) is another case of brand malignment within the perfume hobbyist community, but unlike Bond No. 9 products that take heat because of the eccentricity and dubious morality of the house's owner, this scent takes an unfair amount of heat for being from a house that practically invented the synthetic minimalism that dominated designers in the 90's and still haunts current designer perfumery, when the scent itself is really rather well put together. Escape for Men was far from the first masculine from the house, but it was the first one since Eternity for Men (1989), which for those unaware, is a groundbreaking "fresh" fougère (technically only a fougère in name alone), that revitalized a genre which had taken a backseat to powerhouses and masculine floral chypres throughout the 80's. Escape was the "sophomore" to Eternity in regards to it having to follow up such a drastically different and ascetic game-changing masculine, which alongside Davidoff Cool Water (1988), was reshaping masculine perfumery into cleaner and more abstract lines. The "Age of Eternity" as I affectionately call it, would last a little over 20 years, with few exceptions to this aforementioned synthetic minimalism being made by CK throughout this time, and Escape asserted that direction. Like most CK scents, the reception to Escape online purely depends on where you go looking for reviews: customer input from shopping sites or more mainstream/populist fragrance databases like Fragrantica range from mostly positive to glowing, even if a bit of nostalgia informs those reactions for most nowadays since the stuff is over 25 years old. Elsewhere that more uppity crowds gather, it's practically set on fire with criticism without actually unpacking and taking in what the scent offers, which is a great disservice. I'm not telling anyone they have to like this because I say so, but like most vintage scents, regardless of decade, there is context that needs to be considered when trying to wear it. For starters, calone was to the late 80's through mid 90's freshies what Iso E Super would be in the 2000's, and norlimbanol/ambroxan would be post 2010. Calone was the wonder chemical of most mainstream perfumers at the time and although mostly used subtly by other designers, in Escape it's cranked to 11. We actually have Aramis New West (1988) to thank for this calone overdose as it appears in Escape, because New West was the first masculine to use calone at all, which is derived from melons, and it is also very prominent in that scent since it's actually one of the focal points around which New West is built. However, since Aramis as a house has a very good reputation among colognoisseurs, everyone in the echo chamber heaps praise onto New West as the freshie "it's okay to like", which in and of itself is a form of peer-induced bias, but Escape has a very similar vibe. In fact, Escape is so similar to New West that I have to call shenanigans on CK for pretty much stealing Aramis' thunder with their take on calone, since CK had the much bigger PR and marketing presence and could sell what's basically plagiarism in a bottle long before cologne guys screamed about designers "cloning" their favorite niche scents. That isn't to say Escape is a New West clone, it's actually a slightly woodsier and drier alternative if you like New West, and anyone who does needs to drop the paltry two pence it costs for a bottle of Escape just to compare them. For those who haven't sniffed Aramis New West and can't do the comparison, I'll describe Escape as follows: Birch leaf, grapefruit, bergamot, juniper, eucalyptus, mango and calone from melon represent the top, with the latter dominating all the other notes, which only seem to be present to keep the calone from being too sweet, since there is just so much of it. The middle is balsam fir, a salty "marine note" from dihydromyrcenol, rosemary, clary sage, and cypress, which when the latter is combined with the oakmoss base, actually almost makes Escape a chypre itself. The aforementioned oakmoss is joined by vetiver, sandalwood, a slight amber, and even slighter patchouli. The final sandalwood stage of the dry down is very reminiscent of Chanel Égoïste (1990), which is quite the compliment for any CK fragrance to be sure. At the end of the day, what we have is a fairly misunderstood scent that effectively blends a fruity melon-powered top with greens and aquatic aromachemicals before settling into a dry semi-oriental chypre hybrid base. It's still synthetic in many ways, but no more so than Eternity, and doesn't even yet have the fake "Kleinisms" fantasy notes found in later releases, yet it gets raked over the coals worse than some of these inferior follow-ups for the name of the house on it's bottle, when in fact it should draw criticism for being a quality, if shameless rip-off of New West's primary beach bum theme. The stuff is still very painfully 90's so there's also the point of contention of whether or not you want to smell like a period regardless of the performance or style, but that's where the context I mentioned earlier comes into play. 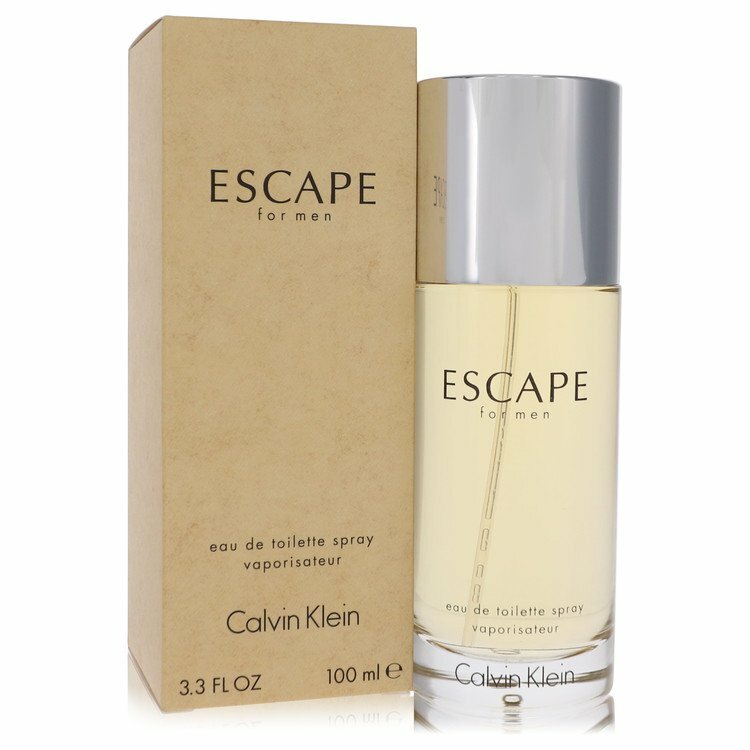 Escape is clearly a casual warm-weather scent, as even the name implies some kind of tropical getaway, and unlike Eternity or even Obsession for Men (1986), has no power in an office or indoor setting. Even it's older Aramis-made cousin New West had a little more luck as a generalist due to greener blending and balance, but Calvin Klein Escape for Men is so bright and fruity in the top, then dry and sharp at the bottom, it would just be too tacky in an air-conditioned environment. On a hot, glistening summer day, this stuff is actually amazing to behold. If you can forget the fact that this is a Calvin Klein scent, or that it isn't terribly original, just long enough to take in what's presented by perfumer Steve Demercado (who also made Kenneth Cole's debut masculine years later), you might actually walk away with a nice casual summer weekend in a bottle, with a cold beer by the poolside. If you can't stand calone, as it was sort of over-used here the way it was in the later Tommy by Tommy Hilfiger (1995), and was always a love/hate thing about 90's scents in general, I can totally understand; the melon note is really going to be this juice's biggest objective deal breaker. Might I also add that this is likely the only CK masculine to not come in a bottle with stunning design? It's just a cylinder! Master bottle designer Pierre Dinand must have borrowed one of his old designs from his Jacomo days, that's all I'm saying. When there's trouble in paradise, wear Escape! I don't smell fruit or anything aquatic. This is just bad in my opinion. I was thinking this would be similar to Eternity...boy was I wrong. This smells very similar to Guy La Roche's Horizon. Before I tried either one of them, I saw people describe them as having an oceanic/beach-like quality. I assumed that meant it was fresh and aquatic...I'm guessing that description means you smell like you were bathing in salt water. Maybe. More herbal and dry, nothing coming close to being watery in my opinion. I now know why CK has a bad reputation in the fragrance community. Reviewing a fragrance from the house of Calvin Klein can be a little tricky at times because they try and play with one note which i have found common in 3 fragrances from that house and CK1 being one of them. This smells too cosmetic and flowery and is more toned to the feminine side. The scent falls linear after 45 minutes and its gone after 90. This is something i would definitely not spend my money on. Do not expect great results out of this bottle. An aftershower fragrance for the night time during winters is what CK Escape really is. This scent is targeted toward the consumers who would like keeping only 1 fragrance in their closet for the sake of having one. Yes, the scent is very general. I wont be giving this a thumbs down as there are really terrible fragrances out there and some really good designers too which have been reformulated and actually smell worse. But i cant give this a thumbs up either as this does not fetch something special for me and nor does it appeal to my fragrance likes. The atomizer is really bad. An inadequate orange-and-amber effort, not too far removed from Boss Orange. Not unpleasant, but does not do anything that a decent shower gel would not in terms of imparting scent to the wearer. Dull, and really rather pointless. I always wondered if anyone could ever mix the distinct smell of bananas into a scent and actually make it smell pleasant. My first smell of Escape's top notes remind me of a spicy, fruit cocktail with those sweet bananas in it. Afterwards, it turns into a medicinal, sweet scent that does remind me of the 90s, so I have smelled this before, probably on somebody's dad. Also reminds me of Clinique's Chemistry in the drydown. I bought this blind one day since it was on sale at a local TJ Max. At first i wasnt that fond of it, but i actually grew to like it very much. Its not my daily go to. Its a very nice summer scent, but it is also a kinda sport scent in a way. I ended up using it before and after im going to the gym. I get a few compliments here and there, its not too subtle but last a good while. If you can find it on sale or fairy cheap some where is a good buy overall. Calvin Klein Escape Eau De Toilette Spray 50ml/1.7oz NEW / SEALED! Calvin Klein Escape For Men Discontinued? ?